Trader Joe’s has made me buy some pretty tasty things: panna cotta, popovers, canneles, creme brûlée, and chocolate covered Jo-Joes, among other things. But now they have macarons. Not macaroons, the chewy coconut cookies. 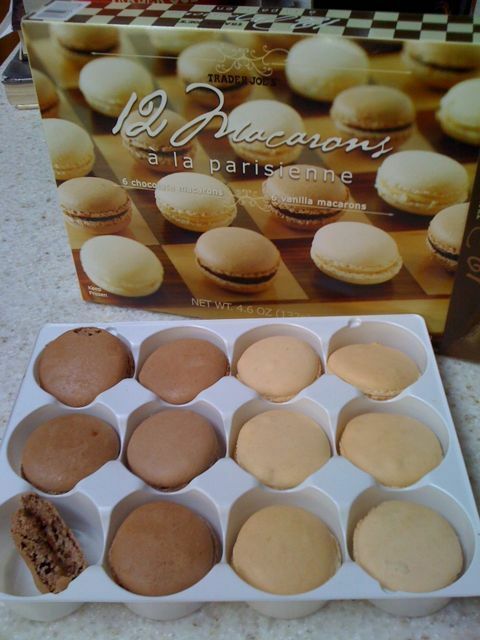 Macarons, the fancy French cookie made of almonds and egg whites and usually filled with something good. Found in the freezer section, you get 12 for $5. That’s a better price than I’ve ever paid for one of these suckers. Are they as good as the best I’ve found in SF or NY? No, but they’re certainly not the worst I’ve ever had. For $5, I think it would satisfy any cravings of mine. This entry was posted in food, trader joe's and tagged macaron, trader joe's. Bookmark the permalink.